This was first posted in r/WatchExchange. I’m new here and will be adding a few more watches for sale here from time to time. I’m just moving a few watches that don’t get much wrist time. I may be open to offers for trade too. This is a rare vintage automatic military chronograph from Hamilton from the 80s. 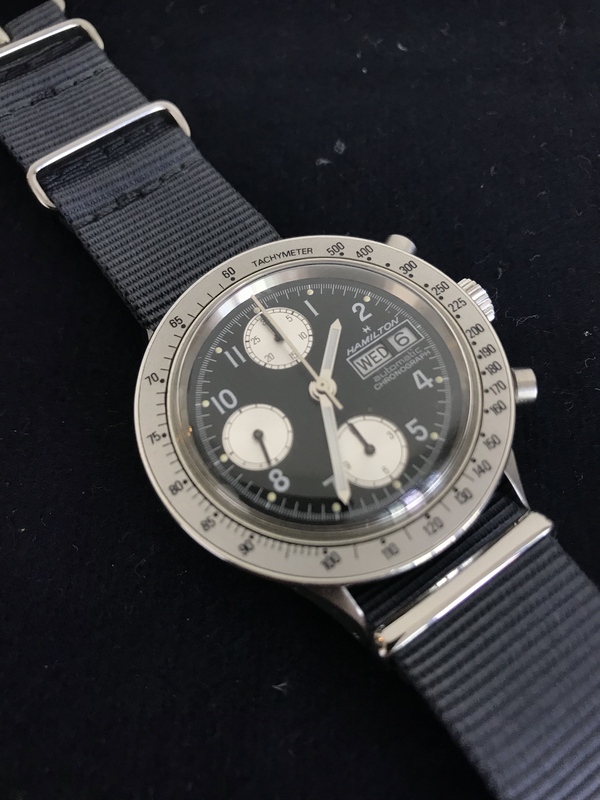 The Black panda dial with silver bezel (super rare!) and the 40mm case makes this an extremely versatile piece. It runs on the famed Valjoux 7750 movement. Runs well and all chronograph functions works as it should. I don’t know its service history. No box or papers. It's in very mint condition for its age. Always gently worn on occasion only. There are no dings on the bezel and the casework shows sharp lines. Signed crown. It will come with a new 20mm faded black / charcoal distressed leather strap with contrast stitching as pictured. I usually put Natos on so this strap is very new. I will include a 20mm luxury seat belt Nato from Blushark if the price is met. There is now a PRICE DROP - I'm now asking US$1200 OBRO. Payment via PayPal, buyer takes care of fees, so do add the 3% upon payment. International shipping from Singapore via Registered Mail is a flat rate of USD25. Registered mail or parcel shipping for local buyers contact me for pricing.